Messier 30 (M30) is a globular cluster located in the southern constellation Capricornus. The cluster lies at a distance of 27,140 light years from Earth and has an apparent magnitude of 7.7. It has the designation NGC 7099 in the New General Catalogue. 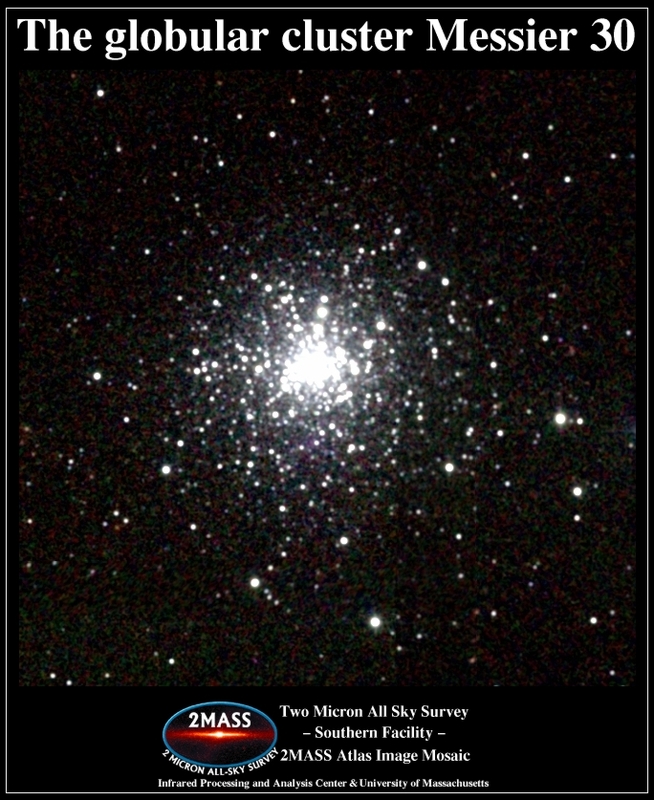 Messier 30 is invisible to the naked eye, but can easily be seen in 10×50 binoculars. It appears as a slightly elongated hazy patch of light about 4 arc minutes across in binoculars, and makes an even finer target for small telescopes. The cluster can’t be resolved at low power and its stars are only revealed by 4-inch and larger instruments. 8-inch telescopes will show a bright small core and the cluster’s large halo. The best time of year to observe M30 is in the summer months. Messier 30 occupies an area of 12 arc minutes of apparent sky and has a dense core about 0.12 arc minutes (7.2 arc seconds) wide. It is a class V globular cluster, which makes it fairly dense, and has an overall spectral type F3. The cluster is not very easy to locate as Capricornus is a relatively faint constellation, especially for observers in northern latitudes, where the celestial goat never rises very high above the southern horizon. 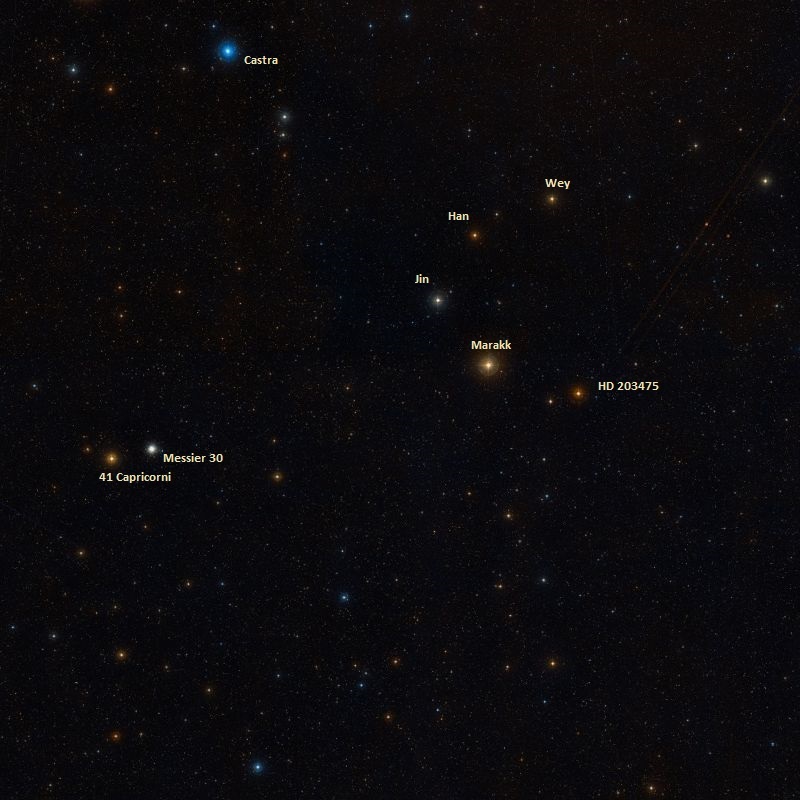 Capricornus lies southeast of Aquila and east of Sagittarius. M30 is located just a few degrees to the southeast of Marakk, Zeta Capricorni, a binary star system consisting of a fourth magnitude yellow supergiant and a white dwarf. 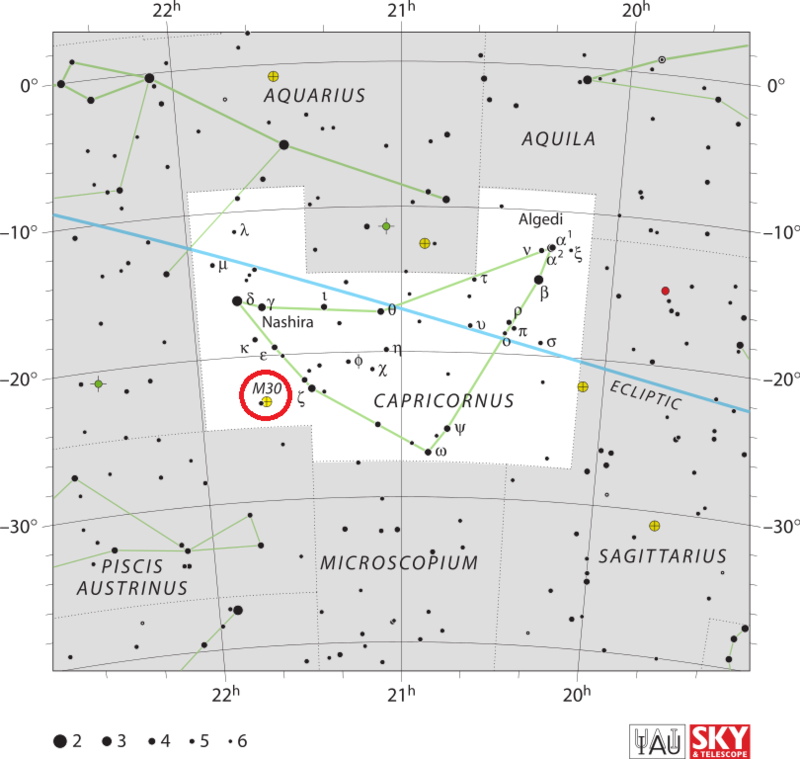 41 Capricorni, a magnitude 5.2 star, lies just to the east of the cluster, making it easier to find in finderscopes. 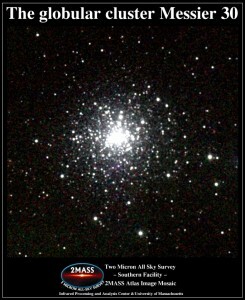 Messier 30 is about 93 light years across, with the core region spanning only 0.9 light years. However, the cluster has a large tidal radius, a region beyond which member stars cannot escape, which spans 18.34 arc minutes, or 139 light years in linear diameter. The cluster is approaching us at 181.9 km/s. It has a combined mass about 160,000 times solar. The estimated age of M30 is 12.93 billion years. The cluster lies at an approximate distance of 22,200 light years, or 6,800 parsecs, from the galactic centre, slightly closer than the Sun, which is about 26,000 light years from the centre of the Milky Way. Messier 30 may originate from one of Milky Way’s satellite galaxies, as it moves in a retrograde orbit through the galaxy’s inner halo. The globular cluster Messier 30. Atlas Image mosaic courtesy of 2MASS/UMass/IPAC-Caltech/NASA/NSF. 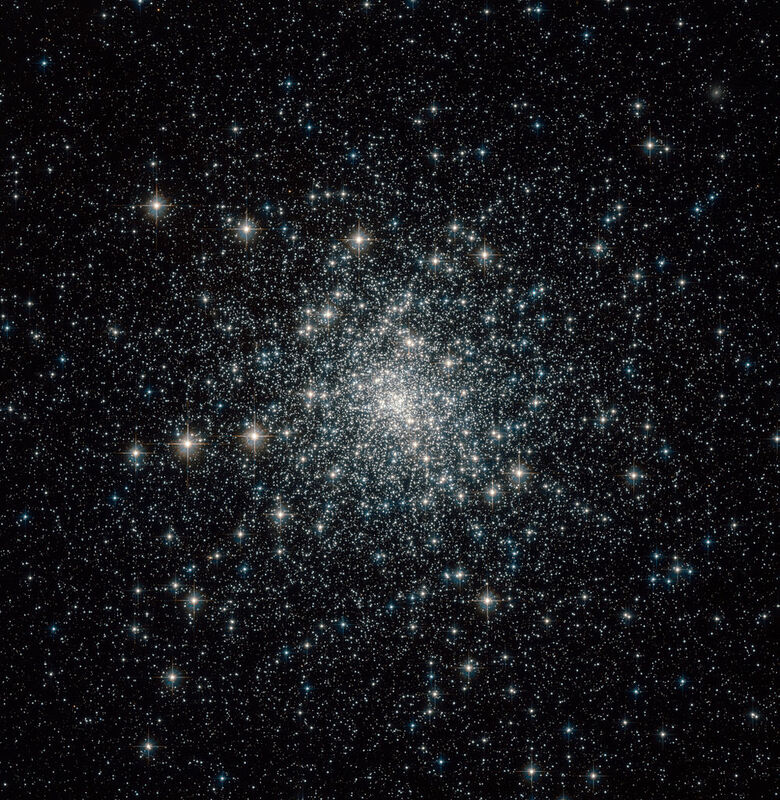 Like Messier 15, Messier 70 and possibly Messier 62 and Messier 79, M30 has undergone a core collapse and, as a result, it now has a dense concentration of mass at its core and is one of the highest density regions in our galaxy. 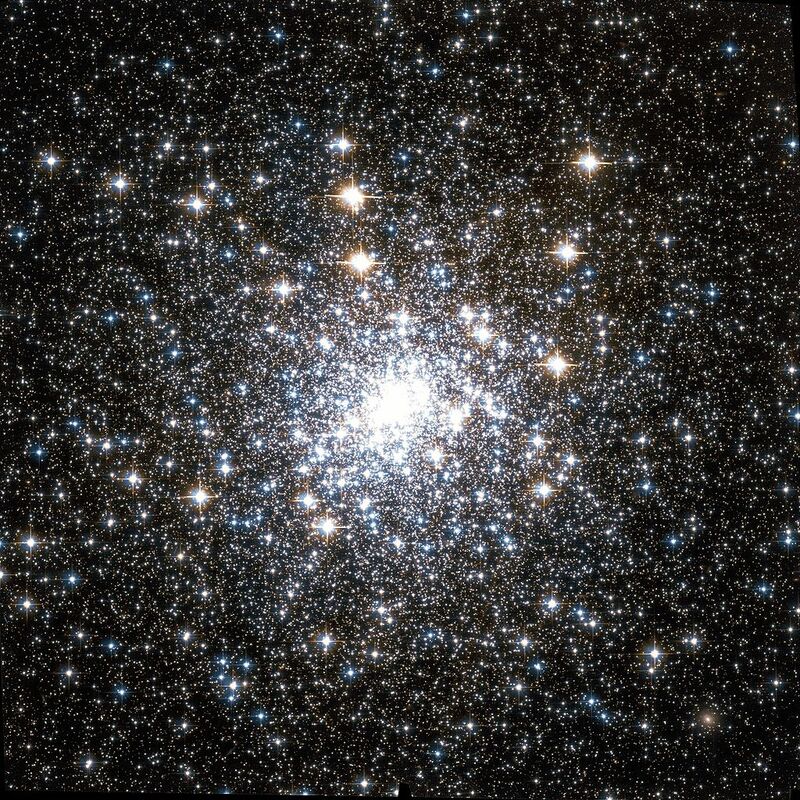 A half of the cluster’s mass is concentrated within a region 17.4 light years in diameter. The stars in this region are greatly affected by proximity to other stars as there is a high rate of interaction and mass transfer. As a result, there is a considerable number of binary stars and blue stragglers in the cluster. Binary systems are created by interactions between stars, while blue stragglers, old stars that appear bluer and younger than they are, are formed either in near head-on collisions or in binary systems where the less massive star steals hydrogen from the more massive one. The brightest red giant stars in M30 have a visual magnitude of 12.1, while the cluster’s brightest horizontal branch giants are of magnitude 15.1. The cluster contains 12 known variable stars. In the night of August 3 to 4, 1764, I have discovered a nebula below the great tail of Capricornus, & very near the star of sixth magnitude, the 41st of that constellation, according to Flamsteed: one sees that nebula with difficulty in an ordinary [non-achromatic] refractor of 3 feet [FL]; it is round, & I have not seen any star: having examined it with a good Gregorian telescope which magnifies 104 times, it could have a diameter of 2 minutes of arc. I have compared the center with the star Zeta Capricorni, & I have determined its position in right ascension as 321d 46′ 18″, & its declination as 24d 19′ 4″ south. This nebula is marked in the chart of the famous Comet of Halley which I observed at its return in 1759. A fine pale white cluster, under the creature’s caudal fin, and about 20 deg west-north-west of Fomalhaut, where it precedes 41 Capricorni, a star of 5th magnitude, within a degree. This object is bright, and from the straggling streams of stars on its northern verge, has an elliptical aspect, with a central blaze; and there are but few other stars, or outliers, in the field. When Messier discovered this, in 1764, he remarked that it was easily seen with a 3 1/2-foot [FL] telescope, that it was a nebula, unaccompanied by any star, and that its form was circular. But in 1783 it was attacked by WH [William Herschel] with both his 20-foot Newtonians, and forthwith resolved into a brilliant cluster, with two rows pf stars, four or five in a line, which probably belong to it; and therefore he deemed it insulated. Independently of this opinion, it is situated in a blankish space, one of those chasmata which Lalande termed d’espaces vuides, wherein he could not perceive a star of the 9th magnitude in the achromatic telescope of sixty-seven millimétres aperture. By a modification of his very ingenious gauging process, Sir William considered the profundity of this cluster to be of the 344th order.